Kelly Driver, Tully, New York, is the recipient of the 2017 Robert H. Rumler MBA Scholarship, administered by Holstein Association USA. The $3,000 scholarship is awarded annually to an individual pursuing their Master's degree of Business Administration. Driver is working towards her degree at Le Moyne College in Syracuse, New York. Driver has been involved in the dairy industry her entire life. In 2009, the New York Junior Holstein Association awarded Kelly as an Honorary Junior Member. She received her Bachelor degree in Agricultural Business-Agricultural Science from the State University of New York at Cobleskill in December 1990. While in college she was involved with the Phi Theta Kappa Collegiate Honor Society. She enjoys volunteering with 4-H and FFA programs across the northeast, serving as a mentor or as an official judge at various competitions. During the 2016 National Holstein Convention, Kelly was the farm tour co-chairman. “Much of my career to date has been spent in agricultural sales and consulting as family farms grow and diversify to continue feeding the world. An MBA is the next step in my career as it will allow me to build a stronger background in finance and human resources and undoubtedly set me on course to be a stronger resource to the industry I am absolutely passionate about,” said Driver. For the past eleven years, Kelly has worked with ABS Global, Inc., most recently as a District Business Manager of the Northeastern States. In her capacity there, she is responsible for coaching and training sales staff, sales planning, and account and performance management. 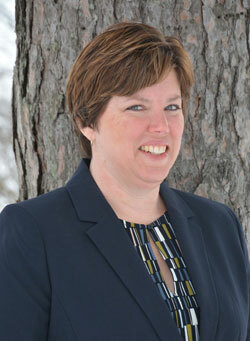 She also works closely with dairy farmers and the promotion of dairy cattle. Four years ago, Kelly implemented the Northeast Internship Program with ABS Global, Inc.
“As I have begun working on my MBA, I have been utilizing skills learned and implementing them into my career. My background has been working with genetics and farm management practices, and the MBA classes are really stretching and expanding my skill set. As I spend more years working within agribusiness, I believe skills gained in the MBA program will be extremely valuable to help and consult in that process,” Driver explained. The Robert H. Rumler MBA Scholarship program was established to honor the former Holstein Association USA Executive Secretary at the time of his retirement after 36 years of service. Rumler believed that U.S. agribusiness, including production agriculture, needed and deserved the best trained, most highly qualified leaders that the nation's educational system and practical experience could provide. For more information on the Robert H. Rumler MBA Scholarship, visit www.holsteinusa.com and click on Awards. Applications are due annually on April 15.